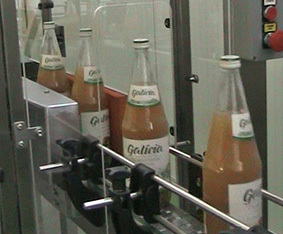 A complete line for bottling of premium apple juice in glass bottles 1L and 0.3L was put into exploitation in Ukraine. The capacity ranges from 5000 up to 8000 bottles/hour depending on the bottle volume. 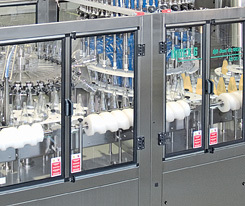 The line is entirely automatic and comprises a pasteurization tunnel ensuring long product shelf life. The bottles are capped with ergonomic aluminum screw caps and labeled with three labels each (IND-Lab 36). Group packing is carried out in cardboard boxes by the IND-Pack 24 robot.